Have you ever noticed that the name Harry Styles is basically just "hairy styles" if you say it fast? Although he shaved off some inches of his locks this summer, more photographic evidence of his recent in-depth spread in AnOther Man shows that Styles' long mane made a temporary comeback for the shoot. Which means one thing and one thing only — the moment is ripe for a tribute to Styles' long hair. Whether or not you prefer his new closely cropped look, you can't deny that his magnificent, glossy mane was responsible for some of the Directioner's very best hair moments — as the AnOther Man spread explores, Styles' hair paved the way to a more sensual side of him, while the return to shorter lengths gets back to his playful roots. The magazine features several covers, which Us Magazine called "clearly Mick Jagger-inspired," and tons of other images of the singer with various hair lengths and wearing different outfits. Styles' hair inspires plenty of fascination, and watching it blossom from scruff cloud, to moderate mop, to full-on Fabio over the years was a real joy. Looking at a series of photos of his long hair evolution is like seeing a time-lapse of beautiful tree. Regardless of whether you enjoy free-flowing hair on guys, no one rocks that kind of hair pushed back, greasy, devil-may-care look in quite the same way — it's like the second coming of Jared Leto's Jordan Catalano. A mane that long and glamorous is a time intensive project, and though it might be gone, it deserves homage. It’s been quite a journey. Take a scroll with me. Making the most of Styles' angular hairline, his tousled locks hit the glossy, scruffy midpoint à la the notorious, so-called "Rich Girl Hair." The sage look in his eyes belays the confidence of someone who uses expensive hair products. Styles was all about that dramatic, voluminous part in his long-haired days. "Lion meets Legolas hits the town," complete with tree stump lichen. Immaculate. The infamous 2015 AMAs. Only Styles' long hair could hold its own against his full-on floral suit. The world hasn't been the same since. He often went for pushed back or side part (best for hair swoop advantages) with long locks, but given the chance, Styles' hair excels at a middle part. However: it makes me think of Lord Farquaad from Shrek. The Catalano vibes are strong here. Look at him, gazing off into the distance. What does he see? Probably a million photographers. Beyond that, a field of dreams... pomades... wax products. This would be a great phone background if that was a thing you accidentally did. Such inner turmoil. What could he be thinking? "Should I shower today?" No, never. Remember in Tangled how her power came from her hair? What if it was the same for Styles? He probably literally stumbled in from off the street and said, "I'm ready." And he looks great. This is included as evidence that Celebs Are Just Like Us — they know growing your hair out is awful. 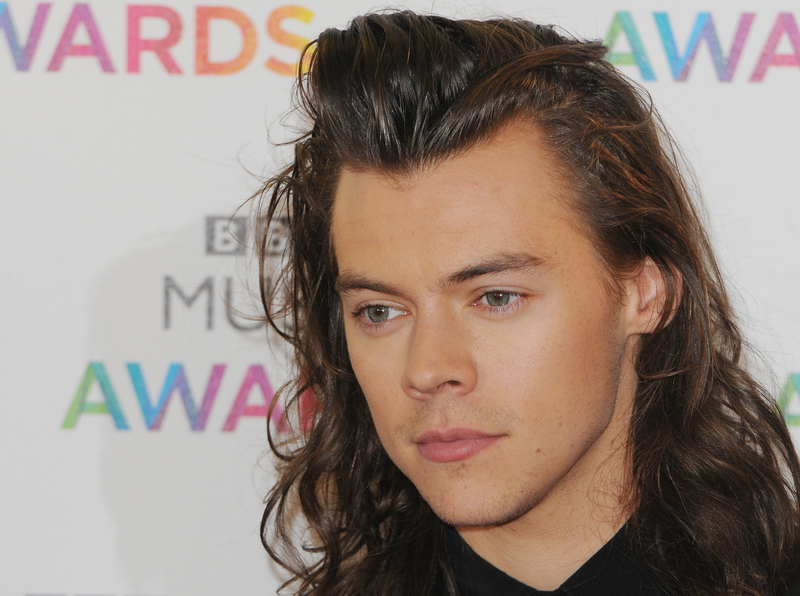 This is where it all began on Styles' head — with the controlled, long-ish swoop. It's like if he was Wolverine and used his claws to do his hair. RIP, Styles' long hair. Good thing we have AnOther Man to remind us how incredible it was.